SOUTH BELOIT, Ill. - After a long and cold Wisconsin winter ArmsUp Motorsports returned to the Blackhawk Farms racetrack this past weekend for the opening SCCA Central Division national race. Returning ArmsUp drivers Jim Victor and Kirk Kindsfater were joined by the team's newest driver Revere Greist at the twisty two-mile track. At the end of the weekend Kindsfater would score a third place result with Greist scoring a fifth for an ArmsUp Motorsports double top-five in the competitive Formula Continental class. Greist, the Madison, Wis. resident, would make his presence known to all in attendance that he will be a driver to be reckoned with this season. In the wet qualifying session Greist put his number 56 car off pole for his first Formula Continental start. Kirk Kindsfater would finish the session just behind in the third position. It was an impressive run for the Colorado driver who hadn't turned a lap since the Runoffs in October until Saturday's qualifying session. Jim Victor was a solid seventh in the running order when the checkered fell on the session. The rains that had fallen the previous day had moved on and a dry racing surface greeted the ArmsUp Motorsports drivers as they took to the track for Sunday's race. 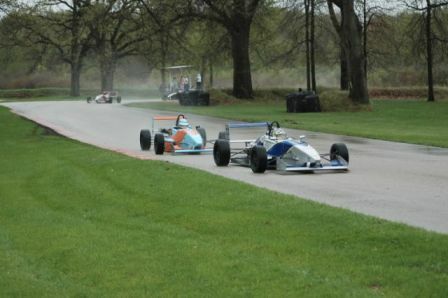 When the green flag was flown Kindsfater was able to get the better of his teammate at the start to slot into second. For the first part of the race Kindsfater and Greist ran together in that order. As the race wore on the Greist's Healthcare Tech Systems car developed a soft brake pedal and he began to lose touch with his ArmsUp teammate. During this time Jim Victor was marred behind a battle of FSCCA cars slowing his forward progress. Past the races' halfway point Greist lost the third spot to former National Champion Brian Tomasi. Kindsfater who had driven a smooth race soon fell into the clutches of a charging Tomasi and was forced to relinquish the second position. When the race came to a close Kindsfater would settle for third and Greist would lose one more spot at the end while nursing his brakes to the finish. Victor would soldier home to a sixth place result after a tough race battling with traffic. "I think this was a pretty good start to the season for us," team owner Gregg Borland said after the weekend. "Revere showed that he is going to have the speed to run up front with his qualifying effort. Kirk drove very well especially given the fact that he hadn't been in the car since October when he went out to qualify. Jim did a good job as well. He got a little caught out by traffic in the race but we know he will be up front again this year." ArmsUp Motorsports will run its first test day at Road America May 8 before returning to Blackhawk Farms May 16 - 18 for the second SCCA National of the season. Kirk, Jim and Revere will be joined by John Greist as John looks to make his first start of the year in the number 61 car. Kirk Kindsfater leads ArmsUp Motorsports Teammates Revere Greist and Jim Victor at Blackhawk Farms.